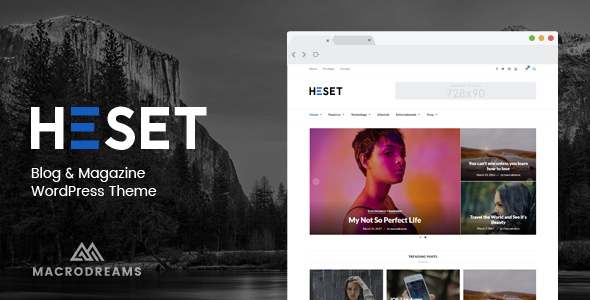 Heset is a clean and easy-to-use Blog / Magazine WordPress theme. Heset is a light weight theme but comes with many useful features that are all easy to setup. You have full control over content, layouts and more. Designed for people who love clean design and functionality. Homepage layout of the Heset theme is fully widgetized which means you can build your homepage content by drag & drop builtin widgets into widget areas so that we can create unlimited layout combination. The theme includes 6 alternative homepage styles. PLUSâ€¦Dedicated Support & FREE Lifetime Updates! Heset theme comes with detailed documentation on how to use them. And if you need assistance with bugs or issues, I will be there to help out. Plus, the Support Center is always just a click away. + Heset â€“ About Me Widget â€“ Add and customize your â€œAbout Meâ€ information. + Heset â€“ Social Icons â€“ This widget displays your siteâ€™s social icons. + Heset â€“ Banner Advertisement â€“ Add your Advertisement here.